Rich & silky, pleasurably pungent & acrid. The character imparted by the roasted coffee beans and the roasted malt are so intricately intertwined as to be One. 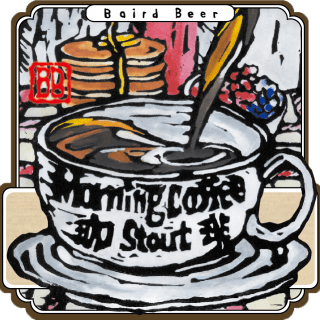 The scene is that of a deliciously furnished breakfast table where in the foreground Baird’s Morning Coffee Stout is being poured into a coffee mug. The kanji combination meaning ‘coffee’ (珈 琲) is depicted on the mug. I love coffee almost as much as I adore beer. Caffeine and alcohol ? a sublime Yin-Yang combination if there ever was one! I brewed our first Coffee Stout way back in 2002, selecting Chocolate Macadamia Nut beans from Hawaiian Kona Coffee. In each subsequent year we decided to select a different coffee bean (or blend) for use in the brew. The key is the use of high quality roasted beans that are added direct to the beer on the cold side post primary-fermentation. In other words, a cold ‘beer-extraction’ coffee bean infusion. If you enjoy premium Coffee and fancy drinking flavorful Stout, Morning Coffee Stout is for you! I love coffee almost as much as I adore beer. Caffeine and alcohol – a sublime Yin-Yang combination if there ever was one! I brewed our first Coffee Stout way back in 2002, selecting Chocolate Macadamia Nut beans from Hawaiian Kona Coffee. In each subsequent year we decided to select a different coffee bean (or blend) for use in the brew. Beginning in 2015, we turned to the passionate coffee professionals at Shizuoka’s Hug Coffee to help us select each year’s bean and roast. This year, we have used a Hug Coffee roast blend of beans from Columbia and Kenya for cold infusion into our conditioning Morning Coffee Stout brew. If you enjoy premium Coffee and fancy drinking flavorful Stout, Morning Coffee Stout is for you!